Roll-up curtain with Laban the Ghost. This product is made of 100% organic cotton and is GOTS certified. The product is responsibly produced throughout the supply chain, and the working conditions are sustainable and fair. Size: Max height 90 cm. 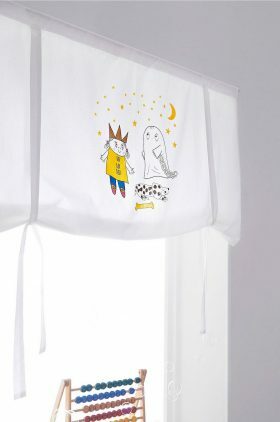 Description: Roll-up curtain in organic cotton with printed design. Care instructions: Wash 40 °. Shrinkage max 5%.